Oswego Speedway's three-time Budweiser International Classic champion, Otto Sitterly, will contend in the first leg of Supermodified racing's Triple Crown this weekend at Sandusky Speedway's Hy-Miler Nationals as a teammate to defending champion Dave Shullick Jr.
OSWEGO, NY – The Triple Crown of Supermodified racing officially opens Saturday at Ohio’s Sandusky Speedway with the running of the annual ISMA Supermodified Hy-Miler Nationals. Consisting of Sandusky’s Hy-Miler, Oswego Speedway’s Budweiser International Classic 200, and New Hampshire’s Star Speedway Classic, the Triple Crown is rich in history and tradition, dating back to 1966 when all three races were first run in the same season. Oswego Speedway’s three-time Budweiser International Classic champion, Otto Sitterly, will contend in the first leg of Supermodified racing’s Triple Crown this weekend at Sandusky Speedway’s Hy-Miler Nationals as a teammate to defending champion Dave Shullick Jr. In that first year Gordon Dukes drove to victory at the Sandusky Classic with Johnny Benson Sr. nabbing the Oswego Classic, and Eddie West earning the inaugural Star Classic crown. While all three events were not contended in the same year until ’66, the Sandusky Classic, known as the Hy-Miler Nationals since 1978, dates back to 1950 while Oswego’s Classic event was first run in 1957. In 1965, Dukes would actually claim the Sandusky Classic and Oswego Classic, but with no Star Classic yet in existence, he would not have a chance at the pure Triple Crown title. After all three events came to be known in ’66; Benson would go on to become the first driver to claim wins in two of the three Classics, with a Sandusky victory in 1967. Benson’s Oswego win and Sandusky win in consecutive years would be his only Triple Crown victories. 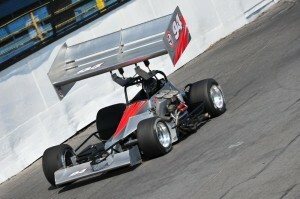 Oswego’s great champion Nolan Swift was the next driver to lay claim to two of three Supermodified Classic titles. Swift had of course won Oswego’s Classic in 1960 and 1963, but his win in 1967 first put him on the path to Triple Crown history. In 1971 Swift earned a Sandusky Classic victory, joining him with Benson and Dukes as the only drivers to win Sandusky and Oswego. Even more impressive, Swift would also go on to win the 1971 Oswego Classic, making him the first driver with a chance to win all three Classic titles in the same season. Swift would never earn a victory in the Star Classic, but would win his sixth and final Oswego Classic in 1972. Joining Dukes, Benson, and Swift as lifetime winners of two legs of the Triple Crown are historic drivers Russ Wood, Chris Perley, Jim Shampine, Gary Allbritain, Warren Coniam, and Gene Lee Gibson. Of those drivers Wood, Perley, Shampine, and Gibson would earn two Classic wins in the same season. Wood, the winningest driver in Star Classic history with seven titles, laid claim to the Sandusky Hy-Miler and Star Classics in the same season back in 1997. With three more victories in the Hy-Miler through his career, Wood has scored a total of 11 Classic wins between Sandusky and Star, trailing only Bentley Warren for most all-time. Perley, who has scored nine overall Classic wins between Sandusky and Star, earned Hy-Miler and Star Classic wins in the same season twice, coming in 2008 and 2009. Most known for his Oswego accolades, Shampine earned an Oswego Classic and a Star Classic in the same season in 1980. Gibson would have a star studded year in 1987 as he would win the Sandusky Classic, Oswego’s Mr. Supermodified, and the Star Classic all in the same season. Unfortunately for Gibson, his try for the pure Triple Crown in that year came up short while battling Bentley Warren for an Oswego Classic win, as Warren Coniam took advantage in lapped traffic to earn another Classic victory. While several historic Supermodified drivers came close to the Triple Crown, only four legendary drivers would earn the feat. Doug Heveron stormed onto the Supermodified scene like none before him, and did so at a young age. By 1981, at the age of 20, Heveron was already a Sandusky Hy-Miler champion and he backed it up with an Oswego Classic win in the same season. Heveron fell short of the Star Classic, and a shot at history in ’81, but in 1982 after winning another Oswego Classic, the ‘Young One’ stormed to a Star Classic victory becoming the first driver to ever win all three Supermodified Triple Crown events. The next driver to turn the trick was Bentley Warren in 1984, and he would do it unlike Heveron, or any driver since. With an Oswego Classic win in 1969 and a Star Classic victory in 1976 Warren, like Heveron, was on his way to claiming a lifetime Supermodified Triple Crown in 1984. With his first win in the Sandusky Hy-Miler in ‘84, Warren would join Heveron as the only drivers to that point to win all three Classic events through their career. However, with another Oswego Classic win in ’84 and a victory in the ’84 Star Classic, Warren officially made history becoming the only driver to ever win the pure Triple Crown, taking all three wins in the same season. In 1986 the New England driving ace nearly pulled the feat again after winning at Sandusky and Oswego, but fell short at Star in the fall. Warren would go on to claim a total of 15 Classic wins between all three events, earning three Hy-Miler victories, six Oswego Classics, and six Star Classics. Watching Warren along the path to history was Oswego native Joe Gosek. After years of trying, Gosek came into true form around 1985, and in 1989 earned his first Hy-Miler win at Sandusky. Two years later he would return to Hy-Miler victory lane and realized a dream of winning the Oswego Classic as well in ’91. Like Warren and others before him, Gosek now had a chance at the Triple Crown later in ’91 at Star, but like many others, he fell short. Four years later however, Gosek would earn his first career Star Classic title in 1995, joining Heveron and Warren as Triple Crown champions. In 2002, Gosek again had a shot at the pure Triple Crown after winning at Sandusky and Oswego. In total, Gosek has eight career Classic victories across the board. The last of the legendary shoes to earn wins in all three Triple Crown events is Mike Ordway, who is the most recent of the foursome to accomplish the feat, finishing the task in 2004. Ordway first won a Classic event in 1998 at the Star Classic before winning the Oswego Classic in 2003 and the Sandusky Hy-Miler in 2004. In total, 65 drivers have earned Classic victories between Sandusky, Oswego, and Star since 1950. Saturday’s Sandusky Speedway Hy-Miler Nationals will begin the 2014 edition of the Triple Crown, with Oswego’s Budweiser International Classic next in line on August 31, and Star Speedway’s Classic finishing the Triple on September 6. Wood and Perley are the only drivers with wins in two legs of the Triple Crown still active, although Wood has not competed since crashing out of last year’s Star Classic. Each driver still lacks a win in Oswego’s Budweiser International Classic to accomplish the Triple. Other recently active drivers with opportunities to earn a second leg of the Triple Crown include Bob Bond, Lou Cicconi, Otto Sitterly, Tim Jedrzejek, Justin Belfiore, Davey Hamilton, Dave McKnight, Joey Payne, Mark Sammut, Tim Snyder, Dave Shullick Jr., and Jon McKennedy. In 2013 only Mike Lichty competed in all three Supermodified Classic events. Jeff Locke attempted to qualify for all three Classics, but did not start the Sandusky Hy-Miler after being involved in an accident in his qualifying heat race. Fans can reserve seats today for Oswego’s Budweiser International Classic Weekend by calling the Speedway’s main box office at (315) 342-0646. Weekend general admission seating is available for $105, with reserved seating set at $115.